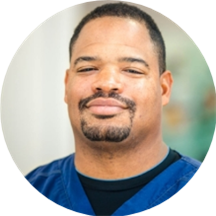 Tommie Harris is a dedicated and caring podiatrist serving the communities of Flower Mound and Allen, TX. Dr. Harris attended the Rosalind Franklin University of Medicine and Science, where he received his degree in podiatry, and completed his residency in podiatric medicine and surgery at Kingwood Medical Center. He holds a bachelor’s degree from the University of Arkansas, Pine Bluff. Dr. Harris is a part of Texas Partners in Pain Management and is affiliated with Texas Health Presbyterian Hospital Flower Mound in TX. He is a member of the American Podiatric Medical Association and the Student National Podiatric Medical Association. Patients see Dr. Harris for a variety of reasons, including psoriasis, foot problems, bunion, nail problems, and foot ulcers. Outside of his practice, Dr. Harris enjoys spending time with his family, golfing, bass fishing, and hunting. Dr. Harris is committed to helping his patients enjoy a healthier lifestyle. He works with each one to discuss ways they can make better choices for their health. He welcomes patients and families of all ages from babies to seniors. I went in thinking one thing about the cause and Dr. Harris corrected my thought with facts and educated me on correcting my issue and provide knowledge on preventive maintenance. He was very personable and understanding in my concerns about correcting my issue. Dr. Harris and his staff were very warm, welcoming, and comprehensive in their evaluation. Dr. Harris explained everything clearly and was very kind. His office is 20-30 minutes away from me, but I will definitely be going back! Dr. Harris was awesome. Very personable and knowledgable. He listened to me describe the issue and provided an excellent explanation of why I am having the problem. HIs treatment recommendations were appropriate for my level of discomfort and he is going to follow up with me. Dr. Harris did my bunion 6 months ago. I have been pain free since my surgery. Very little pain after surgery!! Dr. Harris is one of the most caring & skilled physicians I have ever seen. He performed a bunionectomy on me in June of 2015, and the procedure was very successful. I has almost NO pain and relatively easy recovery eventhough I was 56 at the time. If you want a podiatrist who cares about you as a person, who listens to you, and who is a talented physician & surgeon, then Dr. Harris is the podiatrist for you!! Dr. Tommie Harris, DPM has no appointments on Zocdoc right now.